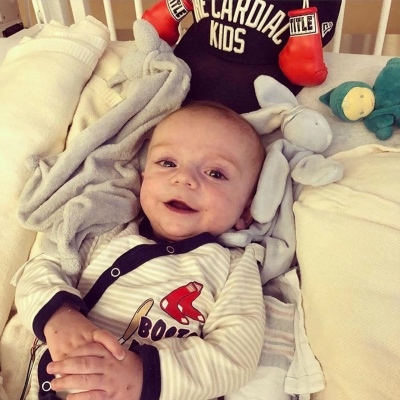 Considering the amount of love in his life, considering how much he seems to enjoy every moment with his siblings and parents, it’s hard to believe 8-month-old Charlie was born with half a heart. 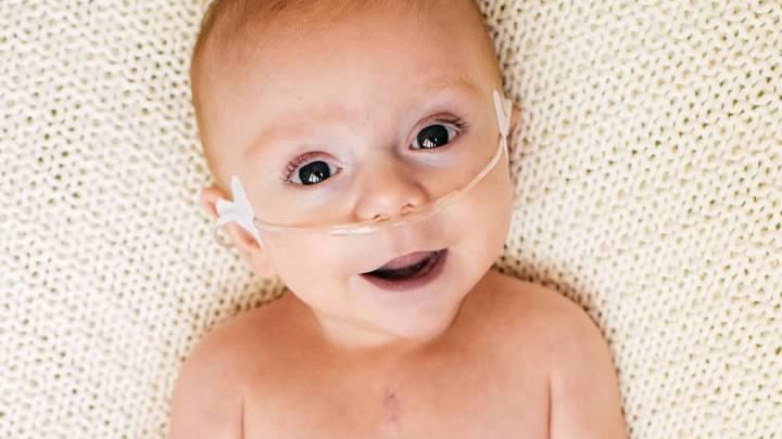 The condition, known as hypoplastic left heart syndrome (HLHS), has led Charlie and his family on a journey that has included major surgeries at Children’s Hospital Los Angeles, and a clinical trial using stem cells from umbilical cord blood. To this point, Charlie has responded remarkably, surviving the most dangerous portions of the process and convalescing better than just about everyone expected. Though his treatment is far from over, Charlie has shown incredible strength and resiliency, and has inspired his parents and doctors alike with his ability to endure and overcome adversity. Alisa was familiar with medically fragile babies. As a nurse in the Steven & Alexandra Cohen Foundation Newborn and Infant Critical Care Unit (NICCU) at CHLA, caring for them was her job. But she didn’t see the diagnosis coming. When she went in for her routine 20-week anatomy scan ultrasound, technicians spotted something that simply wasn’t right. The situation was serious. In a healthy human heart, the right ventricle pumps oxygen-poor blood from the heart to the lungs, while the left side receives oxygenated blood from the lungs and sends it out to the entire body. When the left side is underdeveloped, however, blood flow is significantly impaired, which can cause major circulation problems. 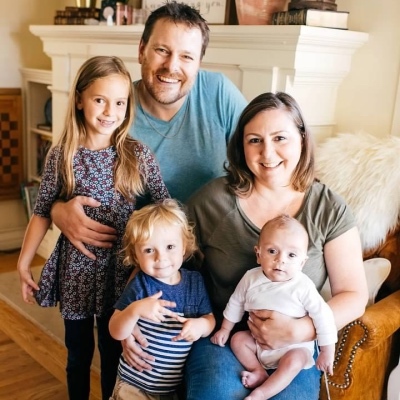 Alisa and her husband, Matthew, soon met Jay Pruetz, MD, Director of CHLA’s Fetal Cardiology Program. Dr. Pruetz explained that about 1,000 children in the United States are born each year with HLHS, which is fatal unless corrected by surgery. He added that children with HLHS must have three open-heart surgeries over the first three years of life to re-route the heart’s blood flow and make the right ventricle the main pumping chamber. These surgeries don’t cure the condition, but they help to restore heart function. Essentially, they work to replumb the child’s heart. Understandably, Alisa and Matthew were devastated by the news. The duo already were the parents of two healthy children and had no reason to suspect a third pregnancy would lead to complications. What’s more, because of Alisa’s 15 years of experience as a nurse in the NICCU, she knew how trying major surgery for an infant could be, and how taxing the ordeal would be on her family. Alisa remembers being “in shock.” Matthew, an environmental engineer, remembers that he struggled to understand portions of the diagnosis, but knew it was bad. That night, after hours of Web-searching and soul-searching, the duo texted with a nurse practitioner friend in Tennessee to get her take and asked her to rank the gravity of the situation on a scale of 0-10. The friend’s answer: 10. Somehow, Alisa says, they just moved forward. Matthew also took inspiration from his beloved Boston Red Sox. After Charlie was diagnosed, Matthew found a hat emblazoned with the label “The Cardiac Kids,” the nickname for the legendary 1967 Sox team, and had to have it. He began wearing it every day. Eventually, he even gave one to Dr. Pruetz. CHLA doctors closely monitored Charlie’s development during the last few months of Alisa’s pregnancy. He was born May 30, 2018 and immediately transported to the Cardiothoracic Intensive Care Unit at CHLA. 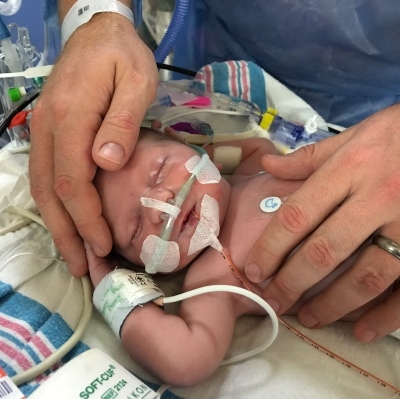 Vaughn Starnes, MD, co-director of the Heart Institute and head of the Division of Cardiothoracic Surgery at CHLA, operated on Charlie four days later. That first surgery is called the Norwood procedure. During this procedure, surgeons took Charlie’s tiny aorta, enlarged it to create a “new” aorta, and connected it to the right ventricle. They also used a straw-like shunt to connect the right ventricle with the pulmonary artery. Together, these measures enable the heart to pump blood to both the lungs and the rest of the body. The operation lasted three long, nerve-wracking hours. When surgeons were finished, little Charlie was so swollen that he spent the first two days of recovery with his chest wide open, covered with gauze. 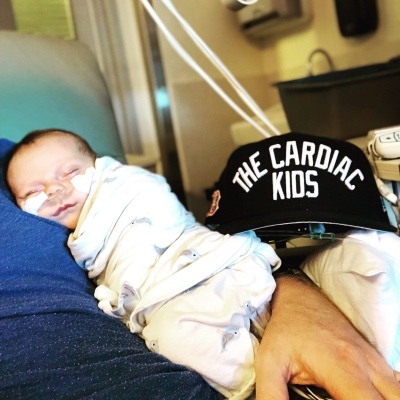 Following this operation, Charlie spent more than two weeks in the hospital, with his parents by his side and a “Cardiac Kids” hat on his bed. When Alisa and Matthew finally were able to take him back to their Burbank home, they had to follow a rigorous course of monitoring—weighing the baby once a day, recording the volume of every feeding and checking the percent of oxygen in his blood multiple times a day. They also had to be vigilant about his contact with their 7-year-old daughter, Edee, and 2-year-old son, Sammy, since any infection could have put him in grave danger. Despite this constant oversight, Charlie gave his family a few scares during those first few months. He was readmitted to CHLA a total of three times between surgeries, including twice because his oxygen levels were low. Alisa and Matthew were exhausted emotionally and physically. Sensing the couple needed help, some of Alisa’s colleagues from CHLA dropped off home-cooked meals and gift cards for take-out dinners to support their friend. Some offered to watch Charlie, too. Alisa also regularly turned to Lisa Rosik, one of her nurse colleagues in CHLA’s NICCU, for peace of mind. Corinne Goodman, a nurse on the Extracorporeal Membrane Oxygenation team at CHLA, offered support while Charlie was an inpatient. Meanwhile, Matthew and Alisa did everything they could to stay positive about Charlie’s prognosis. In late October, Charlie went back to CHLA for major surgery No. 2: the bi-directional Glenn shunt procedure. Charlie responded positively, and this second surgery also included a pivotal step in his participation in a groundbreaking clinical trial for patients with HLHS. Through the trial, a consortium led by the Mayo Clinic in Minnesota was hoping to demonstrate that stem cells from a patient’s umbilical cord blood could stimulate new muscle to grow in the patient’s heart. Because many HLHS patients have heart failure later in life, this new muscle growth could help delay or even prevent problems down the road. Cardiothoracic Surgeon Ram Kumar Subramanyan, MD, PhD, is leading the study at CHLA, and he is the one who injected Charlie’s stem cells back into his heart. During the second surgery, Charlie received five injections in all. Though it’s too early to determine if the cells have had any impact on Charlie’s recovery, his parents and doctors are optimistic. Mercifully, there were no complications with the second surgery, so Charlie’s recovery period was significantly shorter than it was after the first. This means Matthew and Alisa no longer have to quarantine the baby or monitor him so vigilantly. It also means they have been able to take him out and about. Charlie himself is living life like any other 8-month-old: dirty diapers, daily naps, and snuggles with Mom and Dad. The baby is incredibly smiley—Alisa’s Instagram feed is a stream of pictures of Charlie giggling and laughing. His parents report that he seems happiest when interacting with his older sister and brother. Unless you take his shirt off and see his scar, there are no hints of what he has been through. At some point in the next two years, however, Charlie will have the third major surgery of the HLHS trio: the Fontan procedure. Surgeons have been performing this three-part HLHS surgical treatment since the 1980s, and some of the original patients are now reaching their 40s. Dr. Pruetz sees no reason why Charlie couldn’t join this group. And because breakthroughs and better treatments are developing all the time, doctors today can’t really say what the future holds for children like Charlie with HLHS. “But they can be active, have friends, go to school and do everything any other kid would do,” says Dr. Pruetz. For Matthew and Alisa, this possibility makes the surgeries and sleepless nights worthwhile—even in the face of uncertainty. Matthew says the two of them actively work not to live in fear. Alisa adds that she believes every moment with her infant son is a gift, and vows to celebrate every milestone along the way. To help kids just like Charlie, consider making a donation to Children's Hospital Los Angeles. Visit CHLA.org/Donate.